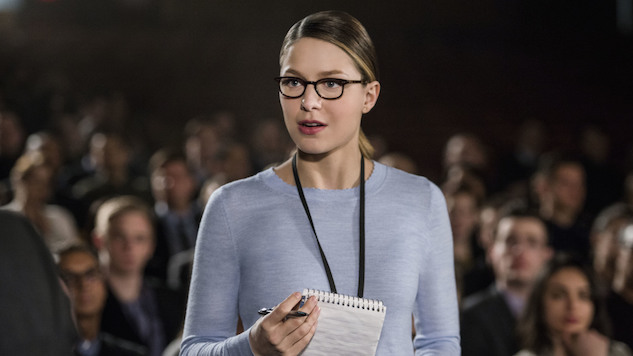 The 5 Best Lines from Supergirl, "Ace Reporter"
Let’s face it: When it comes to action-adventure writing, dialogue isn’t always the production team’s top priority. Looming deadlines mean that, in a mostly plot-driven genre, some aspect of creation is going to get left behind. So it’s the way characters’ speak that usually suffers the most. That’s not a criticism. Just a fact. When you’re trying to write a story set in a universe fundamentally different from our own, when you are creating a society with a whole new set of rules or a complicated sociopolitical background, when you’re throwing around names like Mon-El and J’onn J’onzz, you want to focus on clarity over cleverness. Funny, pithy dialogue will be jettisoned in exchange for just about anything: Narrative momentum and character development have to come first. Take, for example, William Shatner’s infamous scream of “KHANNNNNNN!” We pretty much all make fun of it, but even if you have no idea what’s happening in the story, you’ve got a pretty clear idea that it’s nothing good. All this being said, we’re lucky to be fans of Supergirl. This show gets nowhere near enough credit when it comes to the quality of its dialogue. Fun and quirky in a way that reveals character and creates tension with way more consistency than similar action-adventure fare, it deserves a little praise. So let’s do just that, as we count down the top five lines from last night’s Supergirl. The amount of clever packed into Lena’s throwaway line is hard to ignore. “Ace Reporter” centers almost entirely on Lena and Kara’s friendship, and in a way we haven’t really explored before. Sure, we know why they’re friends. We’ve seen the team-ups and mutual life-saving. That much is clear. But it’s the how of their friendship that drives the episode’s plot. Which means the way they talk to each other is changing as well. We all use the phrase kryptonite to qualify something as a greatest weakness, so who’s to say that that would change in a universe where kryptonite is real? It’s just about a million times more awkward when you’re asking Supergirl herself, and the end-of-scene tension this creates really reveals that this friendship has a long way to go. Honesty in writing is tough. Especially when you’re trying to create a character that is likable on top of it. We all know Lyra’s tough exterior hides a squishy marshmallow interior with a, well, quantifiably violent love for her brother and Winn, but in a show filled with role models and paragons of virtue, it’s tricky to write a character that doesn’t always say or do the “right” thing. Tricky, but important. Though she’s a refugee from outer space, Lyra’s worldview feels just a little bit more human than the 100% self-sacrificing nature of Kara or James. With a little bit of levity, she shows us that being fundamentally good doesn’t mean always being good. Because in the real world, even the best of us have days where saving humanity isn’t our number one priority. So that’s two for Lyra tonight, back to back, but for significantly different reasons. This one will be harder to get a handle on if you haven’t watched last night’s episode yet, but it really shows the importance of the right acting choice to support awesome dialogue. Where Lyra and James’ previous exchange pretty much delivers itself, this line may have completely missed the mark if not for Tamzin Merchant’s brilliant delivery. In the course of a half pause, we see her go from perfectly joyful and in love to suspicious and angry. It all just feels so human, and seeing Merchant act through her moment of realization gives this line the extra punch it needs. Choosing which great dialogue moment to include for Mon-El may have been the hardest thing I’ve had to do this week. As his character evolves, Mon-El’s dual status as love interest/comic relief never fails to disappoint, and tonight in particular he and Kara have some great interactions. What’s most interesting is that Mon-El’s befuddlement with the human world seems to be evolving. His early comic lines and qualities usually focused on his complete lack of knowledge. In “Distant Sun,” he had absolutely no idea about Romeo and Juliet, and I think we all remember his early efforts in bartending. It’s a unique kind of evolution, as his comic missteps now shift to focus on his confusion when faced with others breaking the social etiquette he is trying so desperately to grasp. His comedy no longer focuses on the things he doesn’t know, but instead on the things he doesn’t understand. To let a character grow in this way while still maintaining his voice and core personality is not easy. And that is what makes it applause worthy character development. 1B. Lena Luthor: That elbow to the face. Sometimes actions do speak louder than words. Villain monologues are a time-honored tradition. Where would James Bond be if the bad guys he faced failed to thoroughly explain their evil plans? The answer is, probably dead and a lot more confused. It’s an expositional tool, to be sure, all this villain speechifying, but it can be tiring and repetitive. So we look for ways to mitigate the ridiculousness of it all. Conventional logic seems to be that if we have our hero call out the villain on this behavior, it somehow forgives us as writers for doing it in the first place. This can obviously have mixed results. So I much prefer Lena’s method. Got a talkative villain looking to explain their evil plan for the sake of exposition? Give them two lines to deliver the pertinent information then elbow them in the face. Sure, it’s not exactly dialogue, but you can’t deny that Lena Luthor certainly gets her point across. Sooooo that’s it. No more. It’s time to go back to work. I’m looking at you, Justin. Don’t you have some reports to file? Go on, shoo. The article is over. Okay, you got me. This is a celebration of dialogue, and as great as that elbow to the face is, it just wouldn’t be fair not to end on what is certainly last night’s best line. But brace yourself. It’s not a happy one. Told you so. With so many humorous moments, it’s easy to forget that three named characters die in “Ace Reporter,” a pretty high body count for Supergirl. And one of this show’s best qualities is that the writers never ignore the psychological fallout their characters face. Lena is always walking a tightrope as a Luthor. There’s an underlying tension that one misstep, one grief too far, might be the thing that turns her into a villain. The line itself is beautiful, but it’s the ellipses, that pause, that conveys the true horror of the situation. Lena isn’t going to just come out of this trauma afraid of the world, but of herself. She won’t just be jumping at shadows on the wall, but at the shadows in her mind. A new wariness of the threat from within has her shaken. Oh, and then Teri Hatcher shows up.